Kazakhstan's President Nursultan Nazarbayev said a strategic cooperation agreement signed with Turkey was of historic importance, adding relations between the two countries had an increasingly growing nature. Nazarbayev visited Turkey earlier last week, meeting with Turkish President Abdullah Gul and Premier Recep Tayyip Erdogan. 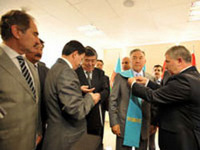 The Kazakh presdient also participated in a meeting of the Turkish-Kazakh Business and Investment Forum in Istanbul. Nazarbayev said Turkish businesspeople in Kazakhstan were willing to make investments in the sectors of agriculture, industry, energy, construction and metallurgy. Turkey "happy with level of economic coop with Kazakhs"
Turkish Industry and Trade Minister, Nihat Ergun, said Friday his government was happy about where Turkish-Kazakh economic cooperation reached. Speaking at the Turkish-Kazakh Business and Investment Forum in Istanbul, Ergun said that Turkish-Kazakh economic relations were not at the potential level. 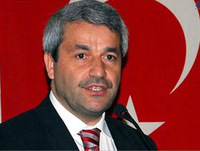 Turkish contractors assumed 291 projects in Kazakhstan worth around 10 billion USD, Ergun said. Turkey ranks 15th as the country with most investments in Kazakhstan. Turkey's direct investments in Kazakhstan were worth 1.6 billion USD, Ergun said. When we look at the economic and commercial relations between Turkey and Kazakhstan, the existing trade volume does not reflect the actual potential, Ergun stressed. Turkey's exports to Kazakhstan in the first eight months of 2009 were worth 402 million USD and imports from Kazakhstan were worth 690 million USD in the same term, Ergun noted. 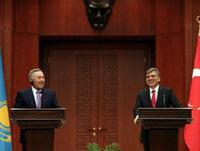 We have to display a common will to further promote economic relations between our two countries, Ergun also said. Turkish university gives Kazakh leader with "honorary doctorate"
A Turkish university honored Kazakh President Nursultan Nazarbayev with the title of "honorary doctorate". The Okan University in Istanbul said in a statement on Friday that it would present Kazakh President Nazarbayev, who is currently paying a state visit to Turkey after an interval of eight years, with the title for his contributions to Turkey-Kazakhstan bilateral relations and development of Kazakhstan as a powerful and influential country. The statement added that the title would make valuable contributions to Turkey-Kazakhstan relations.